Palm Tree are beautiful and few other symbols conjure up such magic as the instantly recognizable outline of a palm. Palms and tropical plant enthusiasts, plant hobbyists, nurseries, wholesalers and retailers are all encouraged to visit this site. Palm Tree types are broken down into 3 sections; detailed information on select species, pictures in a separate photo gallery for each Palm species, and a Palm resource section which covers Palm Tree Care along with general cultural information. Information on Palm history, anatomy and cultivation. Save time and money buying Palms online from Real Palm Trees' nursery. Palms are grown organically and regularly manicured. Experience "Real" quality at discount prices! Here you will find Palms with majestic beauty which can withstand colder winter climates in a Northern environment. These Palm types are well suited for parts of America. Get flowers delivered to you in 24 hours. The Palm Tree Care and Resources section helps you choose the right types of Palms for your environment and hardiness zones. This section also contains information and ideas for protecting the Palm Tree in the cold winter months. For information on Palms growing further North, the Cold Hardy Palm Tree section will provide useful information on Palms that can tolerate below freezing winter cold and if you take appropriate winter precautions Palms can grow as far North as Michigan. Palm enthusiasts keep pushing the envelope growing Palms in colder climates. The Palm Tree pictures section shows excellent images of cold hardy Palm Species. In the Palm Tree Types / Species Comparison, you can find information on a specific Palm Species expected height at maturity, hardiness zone common for the palm, growth rate, soil and light requirements, leaf style - those that have palmate or fan-shaped leaves; and those that have pinnate, or feather-shaped leaves -, and physical characteristics. Palms can be temperamental and education is critical so there is a large section on Palm Tree Care Advice with a strong emphasis about the species but the majority of the site is aimed at cold hardy Palm Trees and the information and pictures are easily digestable. Sun Palm Trees' web site is meant to assist Palm Tree enthusiasts throughout the United States including Florida, North Texas (Dallas), Houston, California, Arizona, Louisiana, Mississippi, Alabama, Georgia and states much further North where cold hardy Palm Trees can be grown with the proper planting and care especially through the cold winter months. In the Palm Care and Advice section we address Palm Trees Frequently Asked Questions and you can read information about Selecting a Palm Tree, the Cold Hardy Zone System, growing Cold Hardy Palms in marginal climate zones and planting Palms. We also have extensive coverage on the USDA Plant Hardiness Zones. We identify what the cold hardiness zone maps are, Palm Trees Cold Hardy Zones Maps Descriptions, and the different zones across North America, Cold Hardy Zones Maps. Palm Trees successful growth in colder winter areas depend on the cold hardiness of the particular types of Palms, the growing micro-environment and of course your care. Palm photos are located throughout the site. The Palm photo galleries can be viewed at the Cold Hardy Palm Trees Pictures section. Below are links to Palm Tree image galleries. Need assistance with your research? Delegate your complex assignment to academic experts at AdvancedWriters.com you can hire to get high-quality writing assistance. Below are 12 common types of Palms that grow in North America. There are many factors that determine the successful planting and maintaining of a species. Microclimates and and other environmental factors determine if a garden or landscape hardy palm will survive in hardiness zones lower than the USDA recommends. Palm tree protected by other trees and shrubs will tolerate the cold winter environment easier than if exposed to the full force of the winter cold. How it handles the winter is partially predetermined by the palm itself: its age, its height, its slight hereditary differences selected out over time by the conditions of its environment, and the health at the time of a winter cold snap. Sun Palm Trees suggests to always verify a particular Palm species can be successfully grown in your region and particular micro-climate prior to Purchase. Ensure you have the proper winter protection for the cold winter months and talk to your palm grower or specialist. Doing a Google search for individuals successfully growing Palms in your area may give you some good pointers. The "edible" or Date Palm Tree makes for spectacular landscaping large areas. The True Date reaches heights of 100'. Canary Island Dates are massive, tough and durable. It has a leaf scar pattern on the trunk which adds to the impressive look. Use the Texas Sabal in formal groupings, as a lawn tree, in large-scale plantings and as that special accent tree. Also called the European Fan Palm this versatile, cold hardy and beautiful. With the fan leaves trimmed up to clear the trunk it makes a beautiful specimen Palm - a delightful natural sculpture to grace your patio or entryway. The largest native palm of the continental United States as well as the only western species, it is also known as "Desert-palm"
Windmill Fan Palms are one of the hardiest in cultivation. They have a distinct look with the trunk covered by dark brown fibers. The Pindo is the hardiest Feather leaf palm in wide cultivation. The species are extremely variable in nature with differences in height, leaf colors and trunk thickness. Sago Palm are actually Cycads or plants. It is not a true Palm but commonly associated as one. Mexican Fan Palm is very drought and salt tolerant once established. Adapted to a wide range of soil types, and climates. Tall and graceful with leafy fronds, this palm gives landscapes a tropical look. Very showy, especially when clumped. 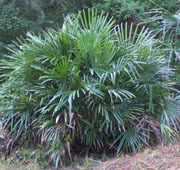 Very old Saw Palmetto can grow trunks above the ground several feet tall capped by a rosette of exotic fans of palm leaves. We hope you find the information and pictures of the Palm species useful. Tropical plant and Palm hobbyists are growing Palms in marginal climates now. You can just look at all the Palm Tree Discussion Boards across the country and many focus on the Northern US. Please contact us regarding any recommendations/suggestions about the site.